What do you think of when you hear the word ‘drum’? I’d assume that most people think of their kids loudly playing a drum kit in the garage, high school football halftime shows, or their favorite rock and roll band. But, most people aren’t us, are they? We DIYers and home decor obsessed people probably have a drum shade spring to mind instead. Or, at least I do. I’ve been rolling around the idea in my head for the past few months on combining the best of both versions of drums. I’m glad that I let my mind wander down that path – it’s a lot of fun when I can dream up something pretty farfetched that ends up becoming reality. Creating this fixture was actually a pretty simple process once I figured out what to do. I put together a tutorial so that you could do it, too. 1. I bought a used Tom drum off of Ebay for under $30 shipped. I’m sure I could have found a better deal at a thrift store or pawn shop around town, but I knew what I wanted and was willing to pay a little extra so that I didn’t have to drag the kids all over town. This Tom is 12 inches tall and 10 inches wide. Any size will likely do – you’ll just want to make sure it will fit in your space. 2. I removed the top and bottom of the drum by unscrewing the screws that hold it together. I was able to unscrew it with my fingers, but you may need a really small socket or “drum key.” Please note, I know not one single thing about drums, and I’m sure the top, bottom and little screws have a name. I’m going to just call them my own terms so that other non-musician DIYers, such as myself, can more easily understand the instructions. The top and bottom will separate from the chrome ring. 3. 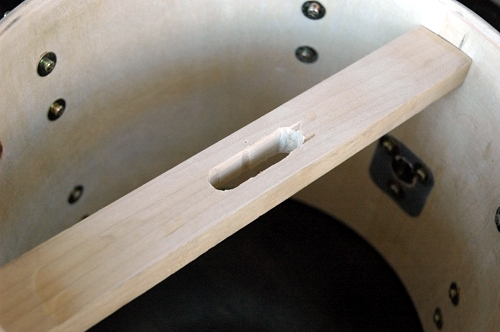 I cut a piece of scrap wood so that it would fit tightly inside the drum without distorting its shape. I didn’t curve the edges; I just cut it straight across. On either side, I hammered in 2 finishing nails to hold it in place (drill small holes first to make it easier). In the below photo, I hadn’t hammered them in all the way so that you could see them more easily in the photo. Obviously, hammer them all the way in. I colored the nail heads black with a Sharpie marker since my drum is black, but they are pretty well hidden by the chrome rings once you put the drum back together, so you might not have to worry about that. 4. Once the strip of wood was in place, I needed to create a slot for my light fixture to thread through. 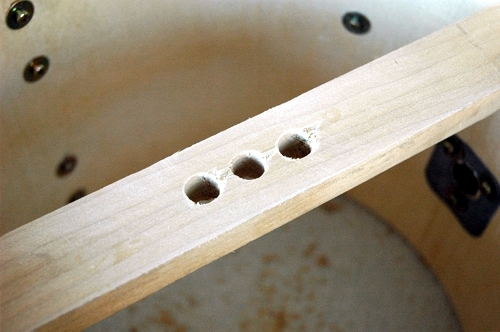 I drilled three holes that were roughly the diameter of the the piece I needed to thread. I used my jigsaw to connect all three holes into one long slot. The reason you need to do this is to be able to balance the drum. 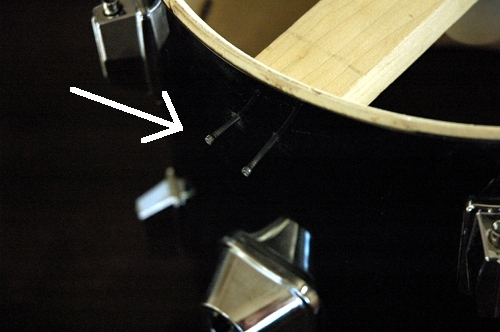 There is a clamp on the side of a Tom that attaches it to a drum kit, and it creates more weight on one side of the drum. The drum doesn’t hang straight from the center, so a slot gives you the ability to slide the fixture around to figure out its balance point. 5. Thread your fixture through the slot. You can pick up a light kit at a home improvement store, which you will hang by a wire and chain. OR, you can do what I did and use one of the Pendant Light Kits from Shandell’s. Instead of having the ugly chain, these kits are made from cloth cord. They come in several colors – red, gold, brown and putty – and in either nickel or brass finishes. These kits are $29 each and I couldn’t speak more highly of them. They definitely give a much more finished and vintage look to a fixture. I have a 60-watt blub in the fixture, but that could vary by project. You will need to test it on your own drum, but mine does not get warm to the touch at all, even when left on for many hours. 6. 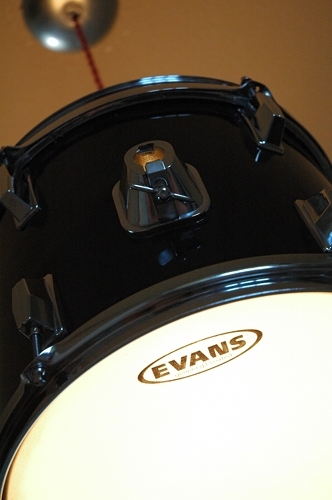 Replace only the chrome rim on the top of your drum (where the light fixture is). You may find that you need to cut (with scissors or an X-Acto knife) the little silver ring off of the what was then the bottom head (they part you don’t play) and put that under the chrome rim. 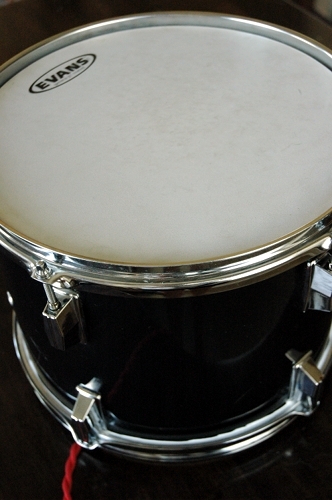 You’ll see what I mean when you start to put it back together – you want the top to be open, but you may need that silver ring as a spacer in between the drum and the rim. 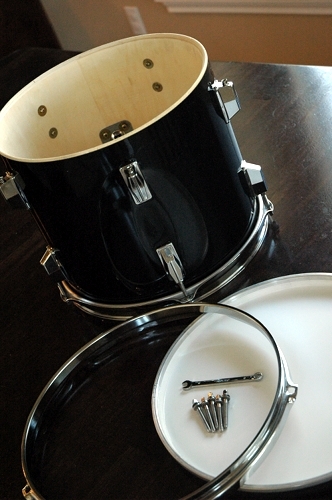 Flip your drum over and attach the head (the part you actually drum) and rim to what is now the bottom of the drum. You can just screw the screws back in with your fingers. 7. Hardwire your new fixture to the ceiling. You’ll want to buy a light canopy to hide the wires. I got mine at Home Depot and spray painted it chrome. I hung my new drum pendant light in a small area of our entry way. I could not possibly be more in love with its quirkiness and originality. 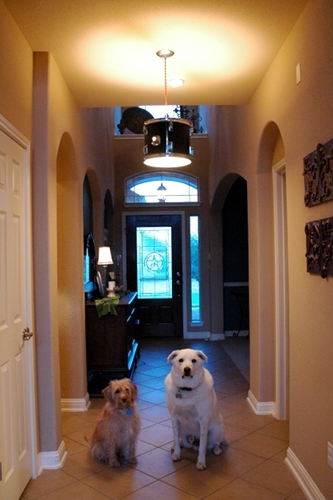 I bet you will be the only one in your neighborhood with this light fixture! My favorite part about it is the amazing light it throws off at night. There is an almost ethereal glow that comes through the drum head, and the light that shines on the ceiling really highlights the fixture. And yes, I totally bribed my dog boys with treats to sit right there. I sure love those crazy mutts, even if their constant barking makes my head feel like I’m actually living in a drum! So, what do you think? Does the term drum shade have a whole new meaning for you now? This would be perfect for a music room! LOVE THIS!!! Want to do this in my boys’ playroom now! Great job! I just love this idea. I love to do this in my son’s room. It’s awesome. That is amazing!!!!! I am going to have to try that, as I live in a loft and was thinking about changing my ceiling light. Great idea. How clever are you?? I absolutely love it!! What a unique idea! I love it! I always enjoy seeing what you’ll come up with next. Oh my gosh – I really want one! Totally fabulous! And the tips you give are amazing, especially the one about balancing it. I was thinking “How did she get the dogs to sit like that?” You are sneaky with your treats! Oh my gosh Lindsay, you’re seriously brilliant! I love drum shades, but have never imagined making one from an actual drum!! I’m going to feature this on my blog today…it’s way too cool not to share!! K, I just posted about this! I love it!! This is the best project/play on words I’ve seen in ages – I love it! I LOVE it!! That’s about the cleverest play on words I’ve seen in a long time. Very timely since “drum” shades are so popular now. Also looks great & serves a purpose. How fabulous in a music room. And how, even with treats, did you get those 2 precious dogs to sit still for a pic? I want to hug both of them, can see why you love them so much!! Genius! So creative Lindsay, but I wouldn’t expect anything else from you!!! This is such a great idea. My husband and I own a music shop and this is perfect for one of our window displays. Especially to light up at night. Thanks so much! Lindsay I CANNOT believe you’ve done this! I thought I was so clever and original coming up with the exact same idea a few months ago. I even bought a little kid sized drum kit on Ebay (couldn’t find a single drum at a reasonable price) in preparation, and haven’t got close to completing it! It looks so beautiful all lit up! Very creative. It really doesn’t even look like a drum now, just a really cool modern light fixture. Nicely done! Also thanks for the tip on pendant light kits. I like the look of the colored cord. Dude, this is seriously creative and so awesome! Wow! it goes so well with the room. Quite literally brillant play on words!! Love the dog boys …. they are so adorable! I saw this on Brooke’s blog! Way original and way cute. Good job! Oh my gosh! Love it! Hang a few more and you will give a whole new meaning to DRUM LINE! That is so cool! How creative are you?!?!? I love that especially for a kid’s room who loves music, but it looks surprisingly sophisticated In your hallway. Well done! SO EXCITED about this! We are expecting a little boy and his nursery is a rockstar/music theme. This will be PERFECT!! THANKS!! I am thrilled with this project ! My son is on his high schol drumline and lives/eats/breathes music ! He is even hoping for a music scholarship to UGA ! Can’t wait to get started on this first thing in the morning using the first tom he ever played ! This will look great along with his old drumsticks and framed music from previous shows !!!!! Oh, this is AWESOME!!! I’m definitely going to build one for Eric’s music room renovation! 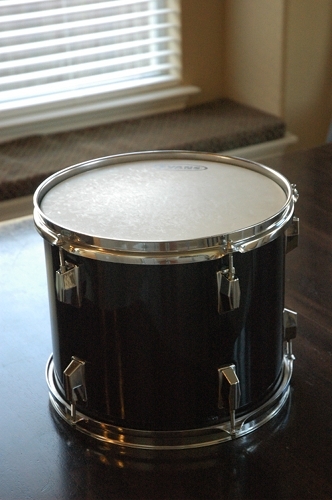 And for those who want to find cheap drums to use [in a variety of sizes/colors] without traveling around looking at flea markets and thrift stores, you need to visit http://www.shopgoodwill.com. That’s a great way to kick this project off to a perfect start! I love it. I have a music theme dining room with clarinet buffet lamps and music related artwork and this is just awesome. However, I need a better explanation on how you were able to hang this light fixture. The associated link works for a fixture with a chain. I don’t understand how the power cord is able to support the weight of the drum. Can you explain? Thanks for the great idea! Hi Scott! The cloth cord I used is made to hold some weight without a chain. After I wired it to the ceiling, we tied the cord around the brace across the ceiling box, so it’s not just hanging from the wires in the ceiling. I hope that makes sense! What a cool idea! I’ve been playing drums for over half my life… and never thought to use one as a literal drum shade. And thanks for the red cord resource… love the modern/vintage looks it gives. Hi Stacey! I’m not able to make one to sell, but I bet you could do it yourself! This is a fabulous idea. I have a large drum that will someday be used as a coffee table and your project will fit in with it perfectly! What a clever woman you are!!! Wow! My awesome son, the drummer, is turning 16 on 12/12/12 and I am wanting something very special & unique for a unique birthday. THIS IS IT!! Thank you!! This drum light totally rocks! Have to show this to my boys… You’re very talented and creative. This looks great! I am planning to use a ‘drum’ shade for my son’s big kid room. I just need to figure out a way to work it with the ceiling fan (a much needed item in our home). Thanks, Christine! 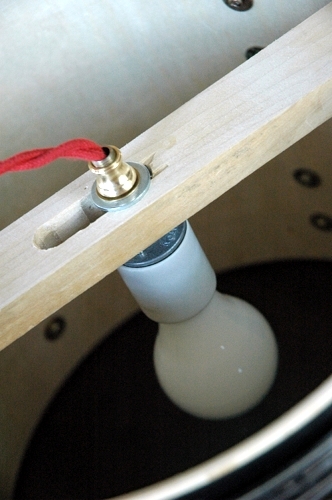 Have you seen the different tutorials on using a regular drum shade on a fan? Here’s one from my friend Sarah: http://thriftydecorchick.blogspot.com/2011/04/prettying-up-ceiling-fan.html Maybe some sort of adaptation of that would work. Yes, I have that seen tutorial, as well as others. Just a matter of finding something that also pleases my husband’s tastes. (He’s anti-drum shade on the ceiling fan.) Thanks for your reply! This fabulous funky and you…Love it!!! Well I’m adding this RSS to my email and can look out for much more of your respective interesting content. Ensure that you update this again soon. 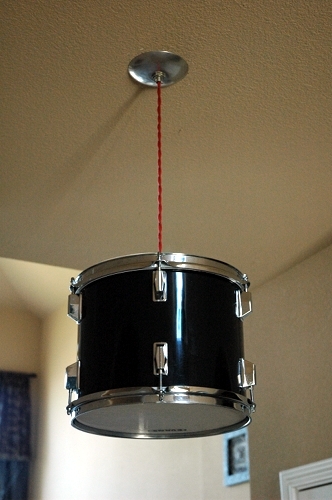 I made a different kind of drum shade light about a year ago…hubby kept asking me to use a real drum though. I didn’t think it would work Now I know better, and he can gloat a bit, lol. That looks amazing! LOVE this! I’m TOTALLY stealin this idea for the studio my hubby is putting in our basement! Actually, they’re called tension rods – the lugs are the part connected to the shell that the rods screw into. Hope your project turned out well, I’m sure your hubby appreciated it! As a musician, I really appreciate this idea. Plus it actually works. Great creativity. Super cool. I love quirkiness! Aquired a tom at the dump for free (score! ), borrowed a drum key, planned on soaking the hardware in *name brand* cola, then was all like ‘how am I gonna? ?’ Ah, THIS. Thanks for making it not intimidating!! And taking the time to post it! Im obviously a few years behind on telling you that this is a GREAT idea. So…this is a GREAT idea! Thanks for posting. “EXTRAS”. Ya – extras. I forgot that drummers don’t make mistakes, we blame the lead singer! This is awesome! I must admit, as a musician I am giggling at your terms from the drum parts. Great diy though, looks great! christian roulleau dit :Bonsoir tous,Si tous les pêcheurs sont respectueux, il n’y a rien à craindre pour les pêcheurs truites , ni de la part de la garderie .